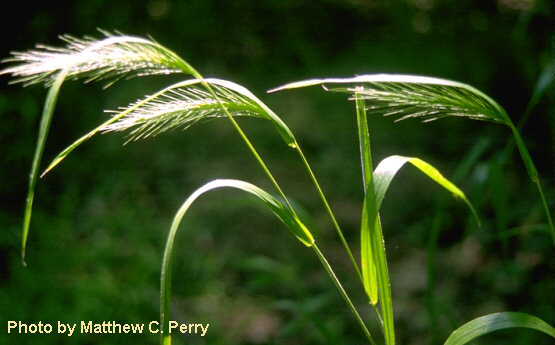 Elymus virginicus.Matthew C. Perry.www.pwrc.usgs.gov (Accessed 5/2014). Elymus virginicus is a perennial C3 grass (Basinger 2002), tufted, 50-120 cm tall. Leaves alterate, 6-10, flat 0.4-1.3 cm wide, rough on both sides, yellow-green, often rather crowded near top of stem. 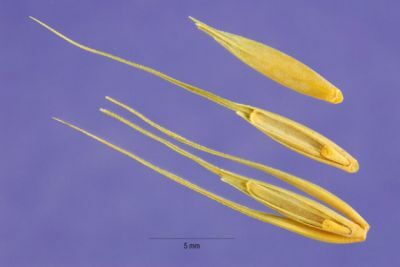 Elymus virginicus spikelets. Jim Conrad. Backyard Nature. backyardnature.net (Accessed 5/2018). 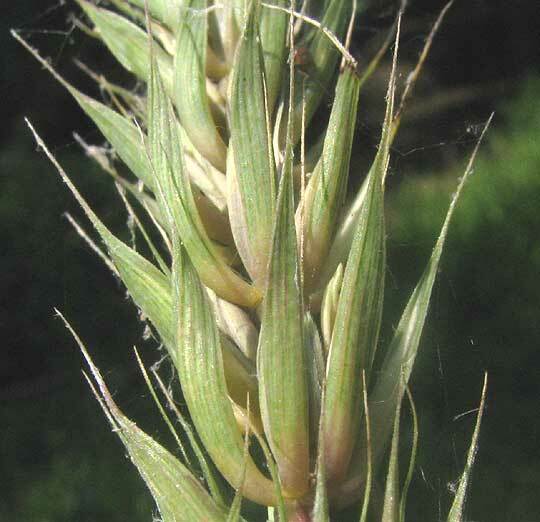 Elymus virginicus spikelet structure. Steve Hurst. USDA-NRCS PLANTS Database. luirig.altervista.org (Accessed 5/2018). Flower spikelets with glumes thickened, rigid, 1-3 cm long, 0.1-0.2 cm wide, base bowed out, almost cylindrical, exposing florets, becoming wider above, and tapering to a short awn, florets 2, lemma firm, 0.6-0.9 cm, long-awned to 3.5 cm (occasionally awnless), palea 0.6-0.8 cm, blunt; inflorescence spike narrow, stiff, erect, dense, 4-12 cm, yellow-green, base often tucked inside uppermost leaf sheath June-Oct. (Brown 1979). Habitat: Moist open meadows, woods, open, sandy soil pH 5-7 (USDA, NRCS 2010).